One of the most organised tourist beaches on Santorini is Perissa which is very pleasant but can get busy. If you prefer a quieter experience there are plenty of smaller beaches that are just as beautiful. Vlyhada beach and Katharos beach are very good. In Santorini there is also a nudist beach at Kolumbo. 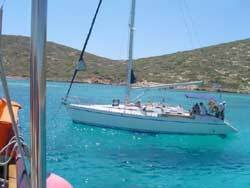 On Sifnos, one of the nicest beaches is Platysgalos. 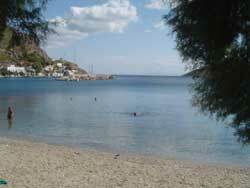 Other good beaches are at Agia Marina and Vathy. In Ios, swim the beach of Mylopotas. On Mykonos Island you can swim at the famous Paradise beach, Elia beach, Agios Stefanos beach ,Ornos and Platys gialos.In Andros, swim in the beach of Batsi. 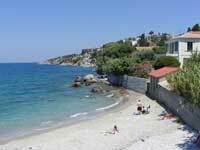 On Rhodes, you will find a lot of well organised beaches like Faliraki beach and Kalithea beach. Crete is the largest island in Greece and also probably the most visited. Being such a large island it has many beautiful beaches to explore and visit. 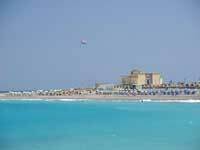 To mention a few, there are the beaches in Alounta, Hersonissos, Agios Nikolaus and Akrotiri beach. these are on the north side of the island. 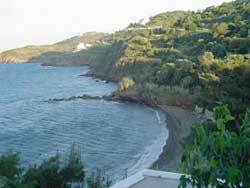 In the south of Crete you will find amazing beaches in Agia Pelagia and Matala. Matala beach was very popular in the 1960s as a hippy nudist beach. All over the Aegean you will find beaches suited to every taste. Those ideal for scuba diving can be found all over the coasts of many of the Dodecanese islands such as Leros, Lipsi and Agathonissi. 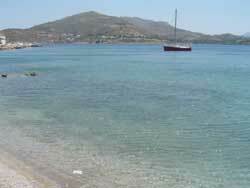 Kos has plenty of long sandy beaches in the areas of Lambi, Kardamana and Kefalos. 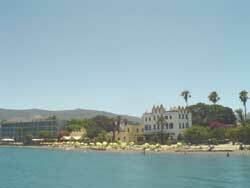 In the Ionian islands you will find in Corfu the famous beaches of Paleokastritsa and Sidari. Also the beaches of Zakynthos, Cephalonia, Ithika and Paxi beach. Halkidiki in northern Greece has wonderful beaches, especially in the Peninsula of Sythonia and the Peninsula of Kassandra. Also in north Greece you will find lovely beaches in Katarini and Platamonas. In the area of Mount Pillion, on the side to the Aegean, there are amazing places for swimming. Check our reviews of some of the best beaches in Santorini, Mykonos beaches, Corfu beaches, Paros beaches and Naxos beaches.